A light airy vanilla sponge blanketing a layer of rhubarb in a pool of custard, complete with tips to the perfect Self Saucing Rhubarb & Custard Pudding! I’ve been patiently waiting for my rhubarb to be ready for picking since April, I must have a late variety. We love rhubarb here at the Kitchen Shed and seeing the first leaves starting to unfurl is a sign of things to come in the garden. My love of an easy to make ‘as if by magic’ self saucing pudding set me wondering if I could use one of my favourite classic British flavour combinations, rhubarb and custard. 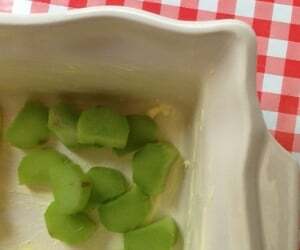 Remember those rhubarb and custard boiled sweets ? So sharp, yet so sweet and creamy. After a few trials and experimenting with quantities and methods, I finally cracked it ! A tender vanilla sponge over a layer of sharp rhubarb revealing its own pool of creamy custard beneath. I trialled the recipe in the slow cooker too (as my Chocolate Mocha Pudding works a treat in the slow cooker) but the results varied – I think the bottom heat of the slow cooker is too much for the milk and custard powder – so the jury is still out and it’s a case of watch this space. 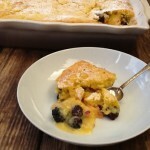 If you haven’t made a self saucing pudding before, don’t worry if this recipe goes against how you might usually bake. Sprinkling sugar and custard powder over a batter and pouring hot milk on the top looks and sounds rather strange but be patient, it works. 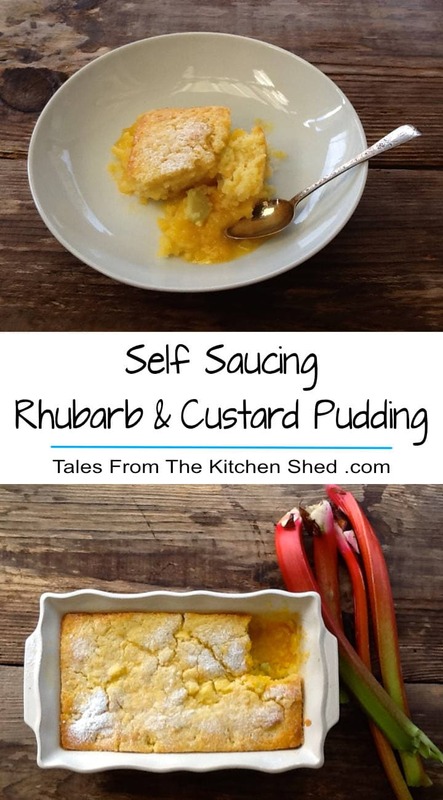 I’ve included a few Kitchen Shed Tips to help you on your way to making the perfect Self Saucing Rhubarb & Custard Pudding. If your tastebuds are not keen on rhubarb or there is a rhubarb shortage – seasonal or otherwise – this recipe also works well with apples or blackberry and apple. 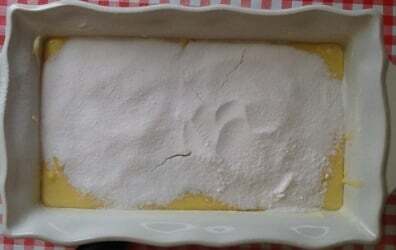 Arrange the sliced rhubarb evenly over the base of your pudding dish and sprinkle with sugar. Pour onto the dry ingredients and briefly whisk until smooth. Pour the batter evenly over the rhubarb. 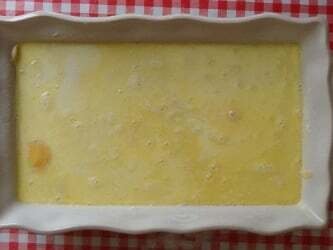 Kitchen Shed Tip: Let your Self Saucing Rhubarb & Custard Pudding stand and set for at least 5 minutes before serving as this allows the sauce to thicken up. Ren Behan’s Simple and in Season hosted this month by Elizabeth over at Elizabeth’s Kitchen Diary. Credit Crunch Munch created by Camilla from Fab Food 4 All & Helen over at Fuss Free Flavours & hosted this month by Lucy over at Baking Queen 74. Honest Mummy’s Tasty Tuesdays, hosted this week by Steph at Misplaced Brit. Really looking forward to cooking this with a group of kids in a half term workshop next week. Was looking for the perfect seasonal recipe and here it is! Thanks Jess, do let me know how you get on. 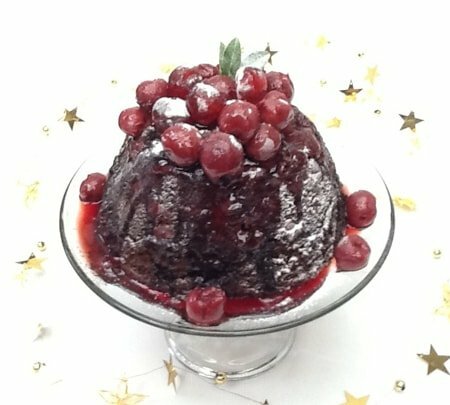 I have always been so fascniated with self saucing pudding cakes and am yet to make any myself. Thank you for the recipe! This looks utterly delicious and certainly one that I will be trying. I love rhubarb and have a big patch in our garden, this looks creamy enough to appeal to the kids. I love self saucing cakes, and I still have loads of rhubarb left from last season – I need to make this cake soon! 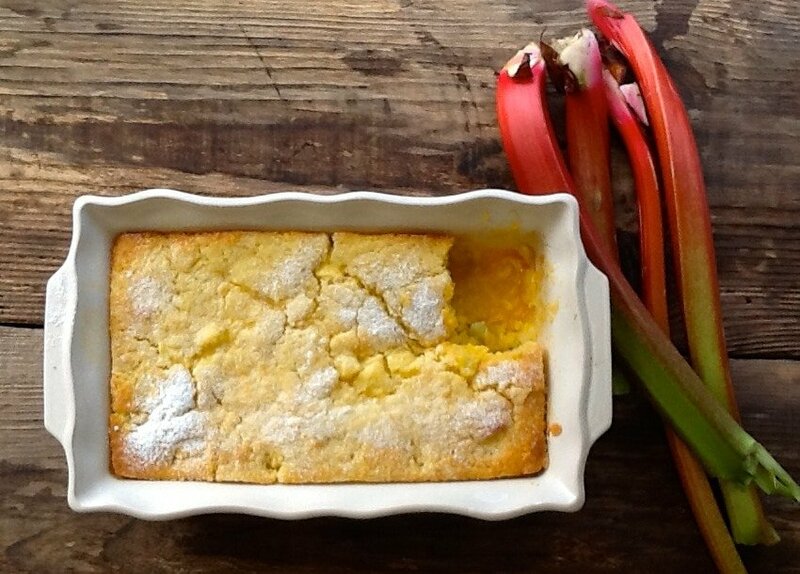 Rhubarb & Custard, a match made in heaven, then you add sponge pudding – that means I want it right now. Can’t wait to try this. Love Rhubarb, I use to eat so much of it as a kid and now it’s difficult to find where I live! Got to find some though to try your recipe. Looks great! I absolutely love rhubarb desserts and pairing it with a custard is perfect! Sounds like a wonderful dessert, perfect for springtime! So you actually grow Rhubarbs? That is so cool, I do love a good dessert and this one surely does it for me. Thanks for sharing Sarah! Never cooked with rhubarb…and your dis looks so tempting especially when I love desserts. Wow, this takes me back to school dinners -the desserts were pretty good. I remember having something similar with gooseberries, it’s the same tart/sweet combination. I have never had rhubarb. I’ve heard it tastes kind of like strawberries. This recipe makes me want to hunt some down. I love these kinds of desserts. Simple foods are always so delicious. Perfect for rhubarb season. Thanks for popping by Marilyn, look forward to hearing how you get on. Thanks Georgina, it’s my favourite rhubarb pudding and it’s so easy to make too. Thanks for popping by, I hope you do get to try some rhubarb & that you like it. Don’t forget you could always make a blackberry and apple version. Thanks Maria. It is a lot of sugar, I think we have a rather sweet tooth here at the Kitchen Shed. Self saucing puddings tend to use a lot of sugar in the sauce, I’m going to try it with 100 g sugar & I’ll let you know how I get on. 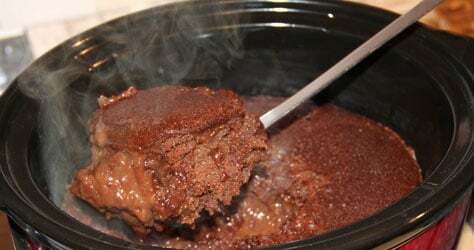 You cannot beat a self saucing pudding can you? Simply lovely! Wonderful recipe! I live in a part of the U.S. where it is very hard to grow rhubarb and you can only get it in the store for a couple of weeks every spring. The apples are a great tip! Love this combination and also love self saucing puddings! So this will be tried out in the near future by me for sure. You’re welcome Lucy, let me know how you get on. This looks so yummy! Have pinned and camt wait to give this a try! This looks so delicious, I’ve never made anything like this. I’ve recently only tried rhubarb again for the first time since I was a child. I loved it! I’ve never tried a self-saucing pudding but love the sound of this – I’ll be pinning it to hopefully try soon and will let you know if I get chance to make it. I may have to substitute the rhubarb though as my husband doesn’t like it. IT seems a shame as rhubarb and custard is such a good combination. Thanks Corina, looking forward to hearing from you. Apples work really well in the pudding, I have made several self saucing apple & custard puddings. I’m so glad you made this comment as I forgot to mention this in the post. 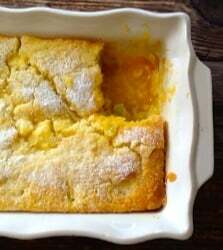 I have to confess I have never tried making a self saucing pudding and I think using Rhubarb and Custard is such a classic British combo that I will have to try. I am just hoping my rhubarb gives out a few more stalks soon as I seem to have gobbled a lot up already. Good tip about pouring over the back of the spoon too. I am delighted you joined in with #loveseasonalfood. I do hope you call by again soon. Ohh I love Rhubarb desserts – and THIS one is in custard!? SOLD! Hi Sarah, Wow, nice pudding. 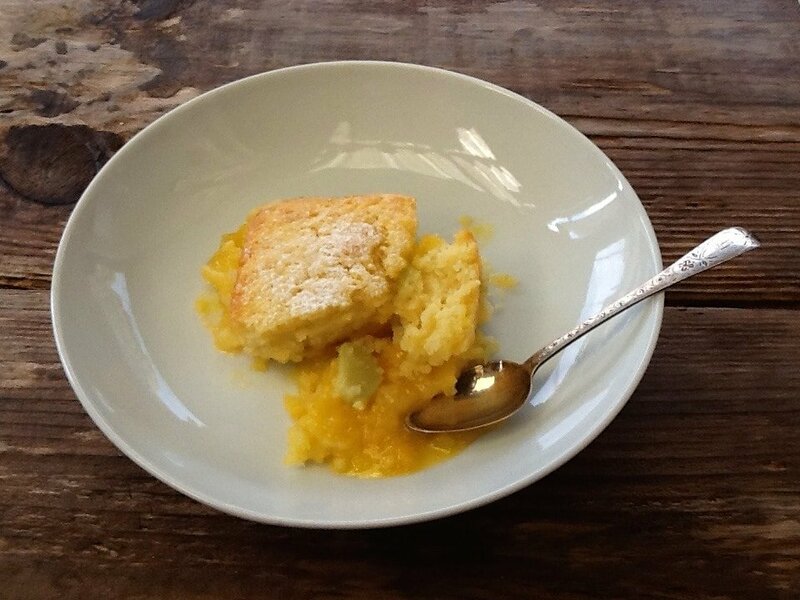 Thanks Elizabeth, it’s a pleasure linking up with #simpleandinseason . 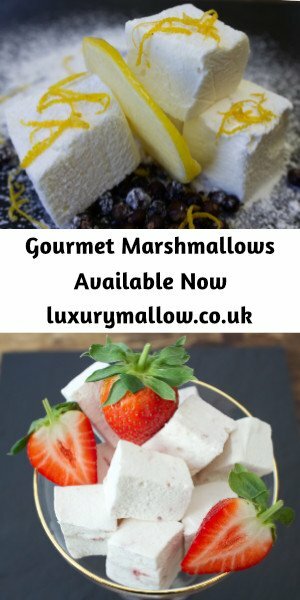 Seems like we need comfort food at the minute with the weather we’re having.